Please Note: For a one off time only, this year we will close our business and cease trading for a 3 month period, commencing 1st March 2019 to 1st June 2019. We apologise for any inconvenience caused and would be pleased to help with your lamp shade requirements as soon as we re-open. Our hand tailored lamp and ceiling shades are traditionally made, each one being hand cut, assembled and trimmed to order. In the manufacture of our lamp shades, only the highest quality Powder Coated and Painted wire frames are selected, thereby eliminating discolouration and rust. The size and shape of the shade generally determine the gauge of wire selection, so as to achieve optimum strength. Only the highest quality fabrics are selected based on their suitability to cover the shape of the frame selected. 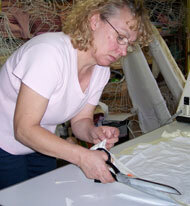 Shades can be made with customers' own fabric, subject to suitability. The lamp shade is lined to protect the outer cover, then the outer cover is applied and tailored to fit. Lining and Fabric is glued and stitched to the frame, using specialised thread and adhesive. The final stage in the hand crafting of the lamp shade is to apply only the highest quality trims. Especially chosen to enhance the overall appearance. Flexibility of colour is achieved by our own ability to dye quality double loop fringe, tassels and lace etc. Hardback shades are of course a slightly different manufacturing process, with a quality fabric bonded to styrene as a backing. Only a top and bottom wire frame is used in this process. We have over 800 shapes and sizes to choose from, or by using your existing shade as a template, we can re-make to your own specifications. 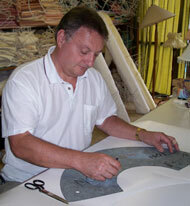 We will explain to you how our hardback lampshades are made to last longer. Care is taken at all times to keep the lamp shade clean during the manufacturing process and our own designer label is attached as part of our guarantee of quality. All lamp shades manufactured by Jenni Ann Products carry an unconditional guarantee against faulty materials and workmanship. The Post Office did a very brisk job again; the shades are safely back home, re-united with their bases and looking very good indeed. Thank you Jenny and Tiffany for a first class job. We may have some more needing your advice/attention later in the year and meanwhile shall tell our friends where to go for good old fashioned craftsmanship and service."